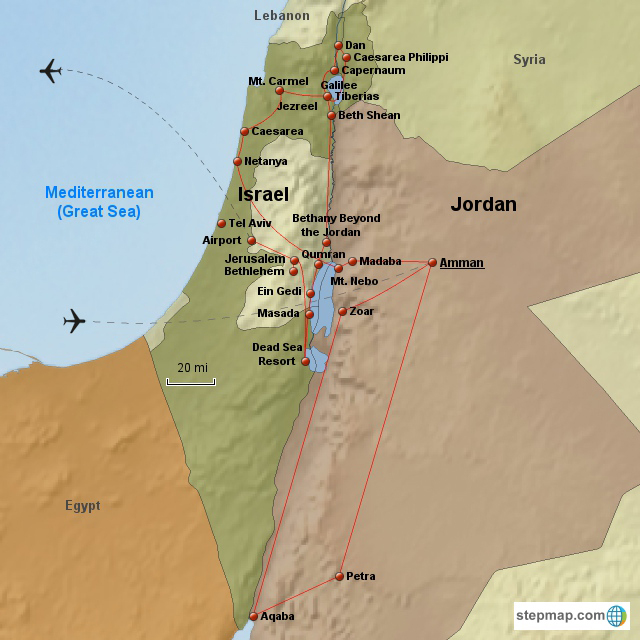 Today we embark on our Journey to Jordan & the Holy Land. Prepare yourself for a life-changing experience. Get some rest on the flight in preparation for the days ahead as we walk the steps of the Bible. 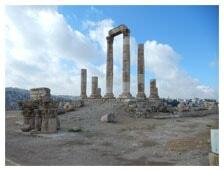 We arrive in Amman, and enter the Hashemite Kingdom of Jordan. You will be met at the airport by our local guide who will arrange shuttle service to the Dead Sea for our first overnight. Most overseas flights from North America arrive in Amman in the evening, so everyone should be ready for a good night’s sleep! Today will be a free day to sleep in, recover from jet lag, and adjust to a new time zone. You can spend the day relaxing doing nothing, or take advantage of the many amenities at the Dead Sea Spa Hotel, including experiencing a swim in the Dead Sea. Following dinner we will have a short meet & greet where you can get to know your fellow travelers and receive a briefing on the important details of our day to day schedule. After breakfast, we officially begin our touring by visiting Bethany Beyond the Jordan, the place where Jesus was baptized by John the Baptist, where Elijah and Elisha crossed the Jordan, and the area where the children of Israel led by Joshua entered the Promised land. Following that we will have the opportunity to share lunch with some refugee families, to listen to their stories, and minister to them in a practical way. After lunch, on our way back to our hotel, we ascend to the top of Mt. Nebo, believed to be the site of the tomb of Moses. We will enjoy a spectacular view across the Jordan Valley and the Dead Sea and read the scripture of God showing Moses the "Promised Land" before He brought him home to heaven. This morning we start early on our journey south to Petra. Although it is a long bus ride, the reward at the end is so worth it! 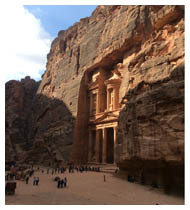 The amazing mountain fortress of Petra is one of the Seven Wonders of the Modern World. We will begin our tour with a walk through the "Siq," an immense crack in the Nabatean sandstone, to the city of Petra carved out of the rose red rock. The Treasury, El Khazneh, is one of the most elegant remains of antiquity. Beyond El Khazneh we are surrounded on both sides by hundreds of Petra's carved structures. After a full afternoon of exploring this UNESCO heritage site we head to our nearby hotel for dinner and overnight. This morning we head back north along the King’s Highway towards the Allenby Bridge. Crossing into Israel, we enter ancient Jericho famed as the oldest city in the world. We will visit the ancient Tel before continuing north along the fertile Jordan Valley. Our guide will point out the agricultural restoration of the “Land of Milk and Honey” and Israel’s intricate irrigation development. Next we visit Beit-Shean/Scythopolis, the most magnificent archeological site in Israel, located at the strategic juncture of the Jezreel and Jordan valleys. Like Jericho, it has been almost continuously occupied throughout history. After defeating Saul and his sons on Mt. Gilboa, the Philistines hung their bodies on the walls of Beit-Shean. During the time of Jesus, Scythopolis was one of the chief cities of the Decapolis - a league of ten cities sharing Greek culture and government. We arrive at our Galilee kibbutz hotel late afternoon where we will overnight for the next three evenings. We begin the day by visiting one of the newest archeological digs in Israel – Magdala, the home of Mary Magdalene. This site hosts the oldest synagogue ruins in Israel, dating back to Jesus’ time. We will also have the opportunity for a worship service in the beautiful Chapel overlooking the Sea of Galilee and celebrate communion in the lower chapel built on a 1st C Roman road. Following our time at Magdala, we will visit Tabgha, the area near the Sea of Galilee where Jesus preached His Sermon on the Mount, fed the 5,000, and appeared to the disciples after His resurrection. If time permits, we will stop at Bethsaida, an active archeological site that was home to the disciples Peter, Andrew, and Philip and a place that Jesus frequently visited. We will then finish our day at the Yardenit baptismal site, where those who wish to publicly display their faith will have the opportunity to be baptized in the Jordan River. We begin our morning with a visit to Tel Hazor, the archeological site of the ancient city of Hazor. During the Canaanite period, Hazor was the largest fortified city in the country and one of the greatest conquests of Joshua and the children of Israel as they settled the Promised Land (Joshua 11). 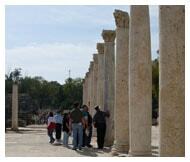 Next we will go to Capernaum, the town on the shores of Galilee that was so prominent during Jesus’ ministry years. 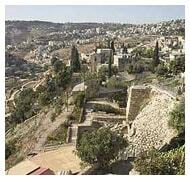 We will see the ruins of another ancient synagogue and what is believed to be the home of Peter’s mother-in-law. After lunch we will return to our home base at kibbutz Nof Ginosar and visit the ancient Fisherman Boat Museum followed by a relaxing cruise on the Sea of Galilee. A brief scripture reading and devotional on board brings to life the experiences of Jesus and the fishermen disciples. 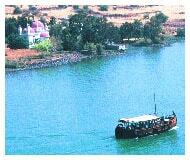 After breakfast, we depart the Galilee traveling west towards the coast of the Mediterranean Sea and on to Jerusalem. En route we have a couple of important stops. First we travel through the Jezreel Valley to Megiddo, the Armageddon Battlefield, where archaeologists have unearthed 20 levels of civilization. Then we head to Caesarea Maritimus, a 1st C city built by Herod the Great. We’ll see the Roman Amphitheatre, hippodrome, aqueduct, and a film on the history and remains of this famous port city. 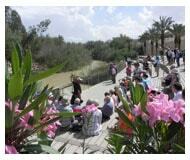 It was here that the Gentiles first heard the Good News from Peter and were baptized. We will then continue on to the Golden City, Jerusalem, arriving there on the opening day of the Feast of Booths. If time and traffic permit, we will make every attempt to attend the Sunday evening service at King of Kings church in order to celebrate the beginning of this annual festival with a Messianic congregation of fellow believers. 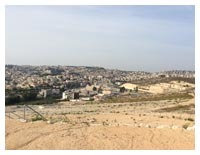 This morning we begin the day with a panoramic view of the city, Mount Moriah and the Dome of the Rock from atop the Mount of Olives. This is a great way to begin our visit to Jerusalem as we can easily picture the relative locations of so many of the biblical events that happened here. Next we will walk down from the Mount of Olives following the route Jesus would have taken on Palm Sunday for His triumphal entry into Jerusalem. Then we will visit the Garden of Gethsemane where we will have time to reflect on the agony and suffering our Saviour endured before going to the cross. Following lunch, we will visit two important museums. The first is the Tower of David where archeologists have unearthed remains from the First Temple Period, King Herod’s time, the Middle Ages and right up to the Palestinian Mandate – 2700 years of history before your eyes! Following this, time permitting, we will visit the Israeli Museum where we will walk through collections of old Israeli artifacts including the Dead Sea Scrolls and tour an accurately detailed model of Biblical Jerusalem, helping us visualize what Jesus experienced during the Passion Week. Conditions permitting, we will start our day early with a visit to the Temple Mount with commentary on the Temple Periods and the variety of belief systems past and present that make this area so valuable. 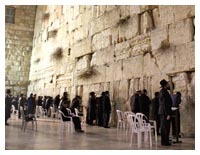 We will then visit the Wailing Wall followed by the fascinating Rabbinical Tunnels which lead us through the Second Temple era. The tunnel and exhibit give a clear understanding of the amazing construction of the Temple Mount, giant stones, water supply and Roman street where our Lord was led to judgment. From here we will see the Pool of Bethesda, Stephen's Gate and St. Ann’s Church. 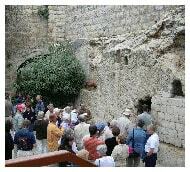 We will then walk the traditional Via Dolorosa on our way to the Church of the Holy Sepulchre. The remainder of the afternoon will be at your discretion to either return to our hotel, explore the Old City on your own, or take a tour of the Yad Vashem Holocaust Museum. Our evening will be spent at the luxurious King David Hotel for a special dinner and lecture/Q&A with an Israeli news correspondent on the current political climate in the Middle East. This morning we board our tour bus for the short drive to the Dead Sea. We will begin with a visit to Qumran, an ancient community of the Essenes and where the Dead Sea Scrolls were discovered in 1946. 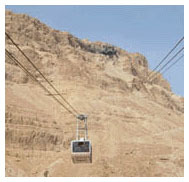 Next we will travel to the mountain top fortress of Masada where our guide will treat us to the history of the famous zealot stand. Next we will visit Ein Gedi, "Spring of the Goat," an oasis on the western shore of the Dead Sea. Because of its warm climate and abundant supply of water, the site developed a reputation for its fragrant plants and date palm groves. This is where King David hid from Saul, and where God defeated the enemies of the Israelites by praise and worship led by King Jehoshaphat. Following breakfast, we will head to the City of David. Although now outside the walls of Old Jerusalem, during the time of David and Solomon this section would have been within the city limits. We will visit Gihon Springs, the original water source for Jerusalem, view new excavations including a typical Israelite four-room house, and the lower city wall. For those with a sense of adventure, there will be an opportunity to walk the 350 yard underground Hezekiah tunnel to the pool of Siloam. We will then visit the Southern Wall Excavations. This southern side of The Temple was the main entrance for the common folk. Parts of the giant stairs which led to the Temple Mount from the courtyard have been unearthed along with the purification pools. From here Jesus entered the Temple Mount and drove out the vendors and money changers who were exploiting the people. It is also likely that this is the place where Peter preached on the Day of Pentecost and thousands were saved and baptized. Next we visit the House of Caiaphas where Jesus was taken following his arrest in the garden, and see a pit where he may have been held for the evening. We will also see the remains of a 1st C Roman road that very possibly could have been the road Jesus walked on his way to Pilate’s Judgement Hall. Lastly, we will head to the Garden Tomb to celebrate the resurrection with communion and a time of praise. The remainder of the afternoon will be free time to either relax, reflect on your experiences in the Holy Land, enjoy one last visit with your new friends, pack for your journey home, or wander back into the Old City for last minute shopping. Then in the evening we will enjoy a final meal together at the American Colony, a historic hotel that has been the preferred overnight accommodation for many journalists and politicians over the years. A) For those choosing the basic tour (Option A), your tour ends today and we will arrange to transfer you to the Tel Aviv airport for your flight home. B) For those who wish to spend one more day in Jerusalem to explore and do things on your own, we will arrange an extra night at our hotel and a transfer to the airport the following day (i.e. October 19th) for your flight home. C) For those who wish to stay one more day and take a guided tour of Bethlehem and the Herodian, we are offering that as an optional “add-on” which will include your extra night of accommodation, meals, guided tour, and transfer to the airport the following day (i.e. October 19th) for your flight home.